Strawberry yogurt drink with sugar and sweetener, added plant sterols. Plant sterols have been shown to reduce blood cholesterol. High cholesterol is a risk factor in the development of coronary heart disease. Consume as part of a varied and balanced diet and healthy lifestyle. The recommended intake of plant sterols is 1.5g 2.4g per day. A 100g bottle of cholesterol lowering strawberry yogurt drink contains 2g of plant sterols. This product is not intended for people with a healthy blood cholesterol level. One serving (100g) contains 2g of free plant sterols. No more than 3g of plant sterols should be consumed each day. Patients on cholesterol lowering medication should only consume this product on the advice of a medical doctor. Cholesterol lowering products may not be nutritionally appropriate for pregnant and breast feeding women and children under five. This product is to be used as part of a well balanced and varied diet, including fruit and vegetables to help maintain carotenoid levels. 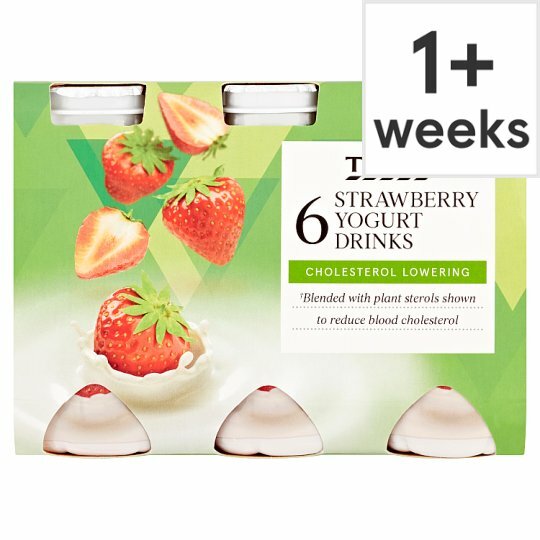 INGREDIENTS: Skimmed Milk, Strawberry Juice from Concentrate (5%), Plant Sterols Ester (3.4%)***, Sugar, Maize Starch, Flavourings, Colour (Anthocyanins), Starter Culture including Bifidobacterium (Milk), Thickener (Carob Gum), Sweetener (Sucralose), Milk Proteins. Keep refrigerated., Once opened, consume immediately and by 'use by' date shown.